3. Multiple Use: waiting for people in the car, parking outside, have a snap during business trip, family outing. 4. Additional function: Use as beach tent or sunshade on the beach, seashore, balcony, and yard. 5. Can be used as ads with printing on the tarp. 6. 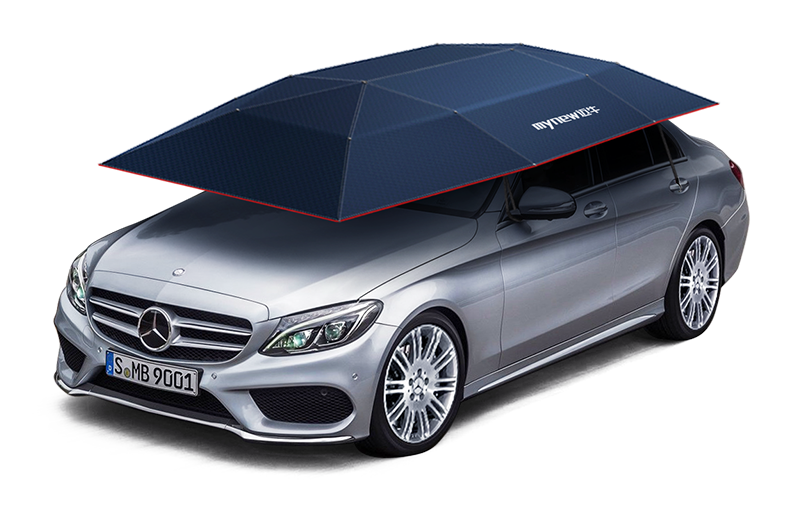 For now we only have automatic and manual car umbrella; new products will be 2-in-1, can be operated by remote controller and manually. 1. Double windproof design prevent the car umbrella to be damaged in heavy windy weather. 3. Windproof rope hang on the reviewer mirror, windproof hook on the handle, adjust the length of rope to appropriate position, to keep the balance of four corners and fix the umbrella. 4. The Half fixed connection between tarp and the skeleton prevent the skeleton from damage, when the wind force reaches level 5, buttons will release automatically, tent and skeleton separated. 2. Standard configuration is car charger, can provide external charger based on customer’s needs. 1. Why I can’t charge my car umbrella? 2. Why I can’t operate the car umbrella by remote controller? There is ON/OFF switch on the handle of umbrella, need switch to “ON” when you are using the umbrella. Switch to “OFF” when you are no longer need to operate it. 3. How to protect my car umbrella from stealing? It’s regular button cell which is common is market, standby time around 2 years, specs: 12V, 27A. 6. What’s the material for the car umbrella cloth? 210D oxford cloth with 3 layers of oil which is waterproof, anti-septic and ultraviolet-proof.